Each time I learn Malcolm Gladwell is publishing a new book, I get excited. I plowed through the last four books with enthusiasm, optimism, and interest. I was left pondering how I could change the way I live my life, or make my mark in the world. So of course, I looked forward to David and Goliath. While this book did make me think more deeply about many of the ideas inside it (and my mind’s logical tangents to them), I was left feeling like some of the key concepts were too drawn out, and consequently not as engaging as I hoped. While some connections between the general and the specific were fascinating, others were plain boring or too far fetched. Let me touch on some of the thoughts that perched themselves in my brain as I read through this book. Can wealth be a tougher road than middleclass-ness? Or than poverty? Why do people who have not gone through trauma in the past often give up so easily (when life gets hard)? Why do we compare others’ best everything to our worst anything? Is it a waste of money to put petty offenders in prison for 25 years? If so, how could that money be better spent to decrease crime rates AND improve the quality of life of the convicts and their families (particularly their children)? If people tend to follow a herd mentality, then in what ways can I consciously deviate from the norm in my career, my goals, my business endeavours, my kids’ education, etc in order to improve the quality of life for myself and my family? How can I more effectively engage my kids when I spend time with them so that we not only have a better relationship, but so that they won’t act out as often? While I have acquired some sense of perseverance and work ethic partially due to the treatment I received from peers because of my disability, how can I deal more effectively with the frustrating residuals of these experiences, such as a lack of empathy, or a fiery temper? These questions and more have left me excited; about both the possibility of becoming a reality, and the idea of helping to clarify societal problems and how to go about solving them. However, the 28 page chapter about tricksters in the civil rights movement was too much of the same type of examples and stories for me. The numerous cases of dyslexia eventually got old. The 34 long pages spent deterring insurgents in Ireland’s civil war; the neighbourhood of Brownsville in New York; and even Nazi occupied Le Chambon, France droned on and on. In my opinion, one of Gladwell’s greatest strengths is his ability to pull the reader into subjects that they may have never been interested in, or even thought about before coming across them in his work. David and Goliath did not quite live up to that expected precedence for me. That being said, I would absolutely recommend this book to anyone who likes to be challenged about their inclinations, and discover new ways of looking at the world. It will definitely leave you with new slants and perspectives to consider, even if you need to drag yourself through (or even skip!) some sections that make your mind wander. 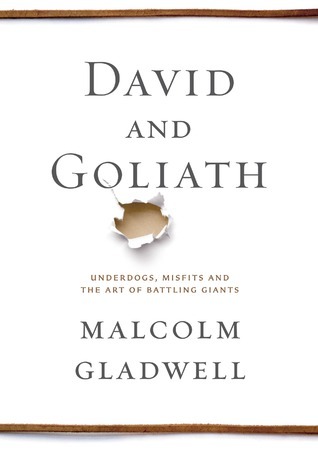 This entry was posted in Muse Reviews and tagged Book Reviews, David and Goliath, Malcolm Gladwell. Bookmark the permalink.